Rio Muerto, CA. 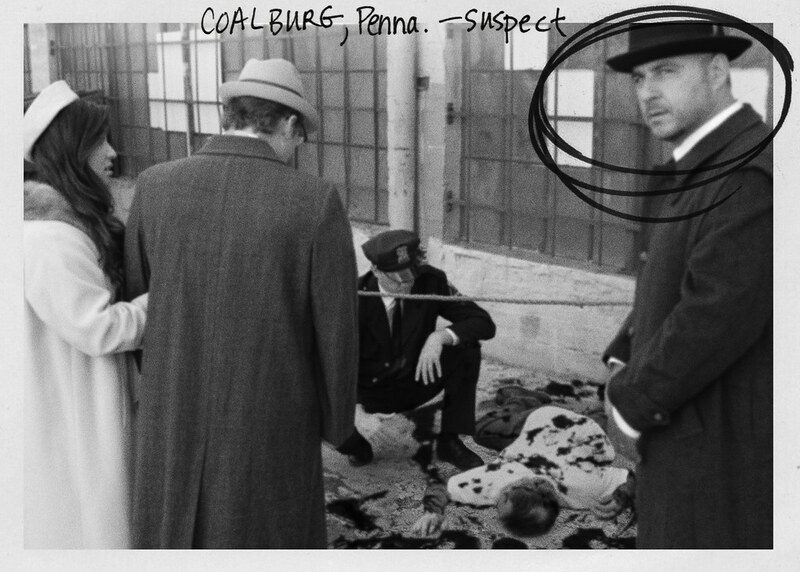 Apparent homicide Telly Pappadakis. 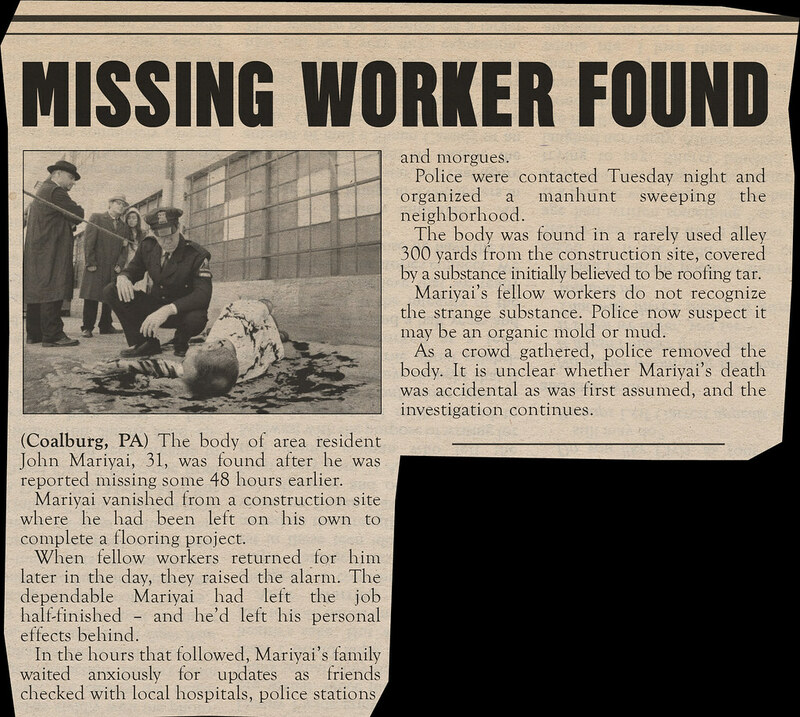 Remains found in desert near diner. 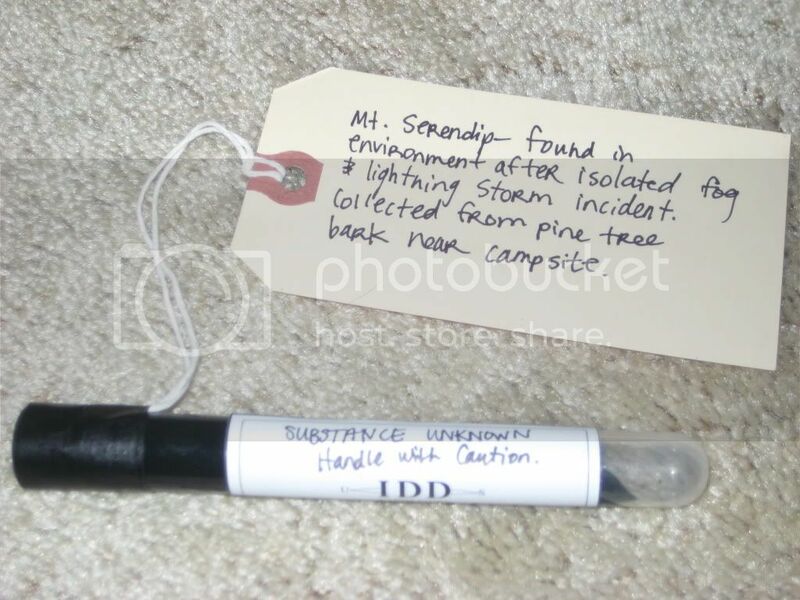 Black substance collected from corpse & surrounded area. sources (e.g. sand, human blood). FOUL PLAY IN DINER DEATH? In the back loading area of the Go-Grilla Diner, State Police investigate the suspected homicide of business owner Telly Pappadakis. SACRAMENTO - Yesterday, California Highway Pa- trolmen discovered the gruesomely disfigure dre- [sic] mains of the missing owner of a roadsider diner. Two weeks ago at midnight, Telly Pappadakis, 53, was seen closing up the Go-Grilla Diner off Highway 66 near Rio Muerto. He was probably in the company of his wife Janice, 27, and an itinerant handyman known as Jack Carver, about 30, both of whom lived at Pappadakis's nearby house. The next day, the diner was closed. Soon, local resi- dents realized all three individuals were missing. The local sheriff investigated the property and dis- covered broken furniture and other signs of a strug- gle in the back offices of the Go-Grilla Diner. Despite an ongoing search, no trace of Pappadakis was found until the Highway Patrol was contacted re- garding what was believed to be an animal corpse lying along a desert road. The disfigured corpse of Pappadakkis [sic] was discov- ered over one mile due east of his property. The Highway Patrol has turned the investigation over to the California State Police. Official reports indicate that the body was gro- tesquely disfigured and was partially covered with a black substance, resembling tar though looser and more fluid. State police are currently investigating the possibility that the tarry fluid was poured on Pappadakis's flesh in an effort to torture him, or to disfigure the body in an attempt to destroy identify- ing marks. Police strongly suspect that the battered, bruised Pappadakis was the victim of foul play. Mrs. Pappadakis and Jack Carver remain missing. Note: This is on the reverse side of the 'Congressional Candidate Asks: "Who Lost China?"' article. Willikie, NJ. Disapp. of Amy J. Framington, 33. Collected from living room floor. Black substance spattered on floor, carpet, sofa, etc. Subject found .25 miles from incident. Mutilated, covered in substance unknown. victim. Cloth sample. Poss. contaminated. WILLIKIE - Following a series of unusual circumstances, Mrs. Amy Jean Framington, 33, remains missing. The Willikie housewife was last seen at a local grocery store at 10:30 A.M. Thursday. Mrs. Framington apparently headed home. At about noon, several neighbors reported sighting black smoke near the Framington house after the area's power was briefly interrupted. Alarmed at the possibility of an electrical fire, they contacted emergency services. Firefighters arrived at the scene to find minimal damage to the house and no sign of a blaze. 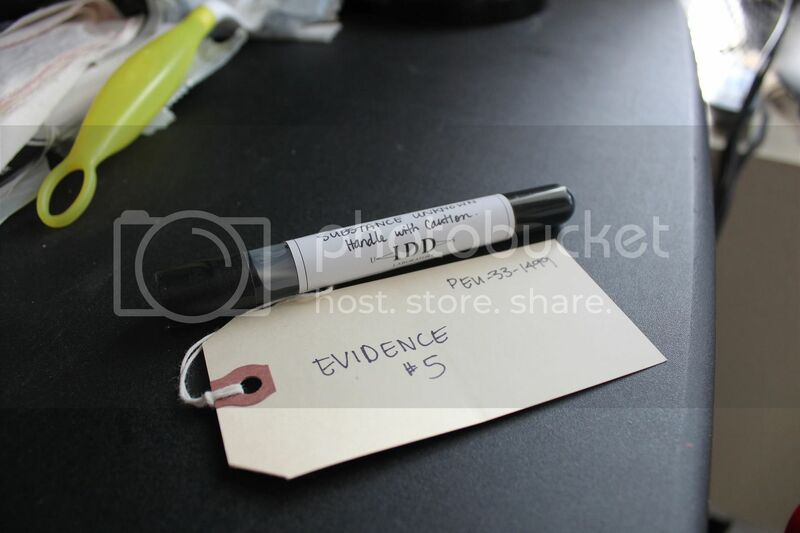 However, black markings from a tar-like substance were found on the floors and walls. No sign of Mrs. Framington was evident. Her husband, Arthur Framington, 34, was in New York City on business and could not be reached by authorities. He returned home to discover several men in shirt sleeves and fedoras prowling around the property and snapping photos. They ignored Mr. Framington and hurriedly left. Mr. Framington has not heard from his wife. Anyone with information regarding the accident or Mrs. Framington's whereabouts are urged to contact the police department. 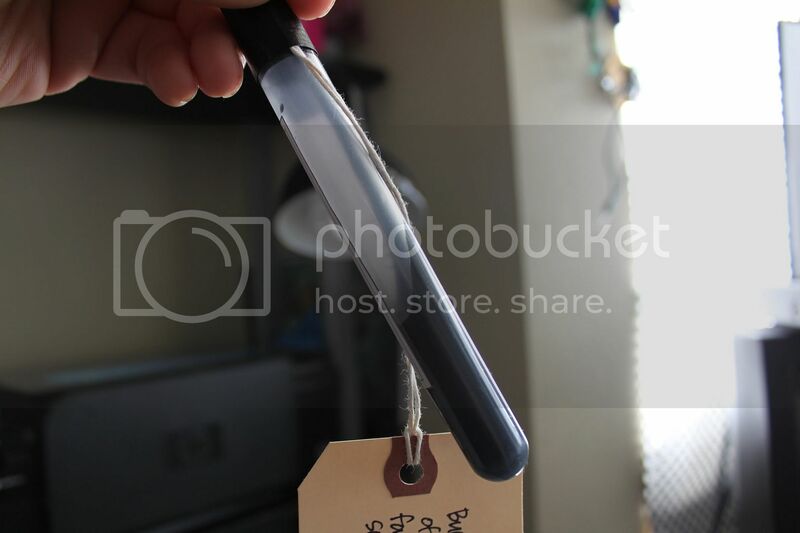 Note: This is on the reverse side of the 'Project Cirrus' article. 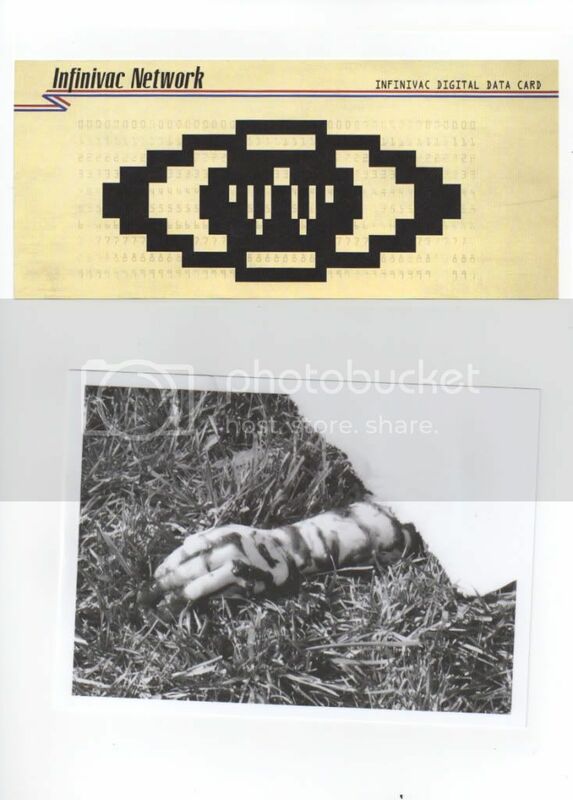 found on site & clothing of suspect W.W. "Lem" Kaylem. inquiry or next of kin. Q: 	-- (cuts in) times do I have to ask this, Kaylem? KAYLEM: Until you stop, apparently. Q: 	You think this is fun - do you think this is funny? 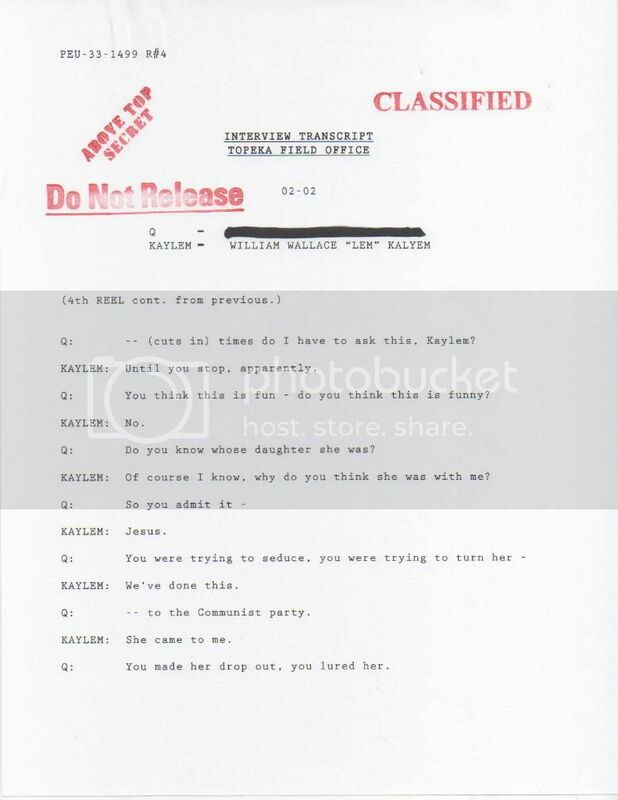 Q: 	Do you know whose daughter she was? 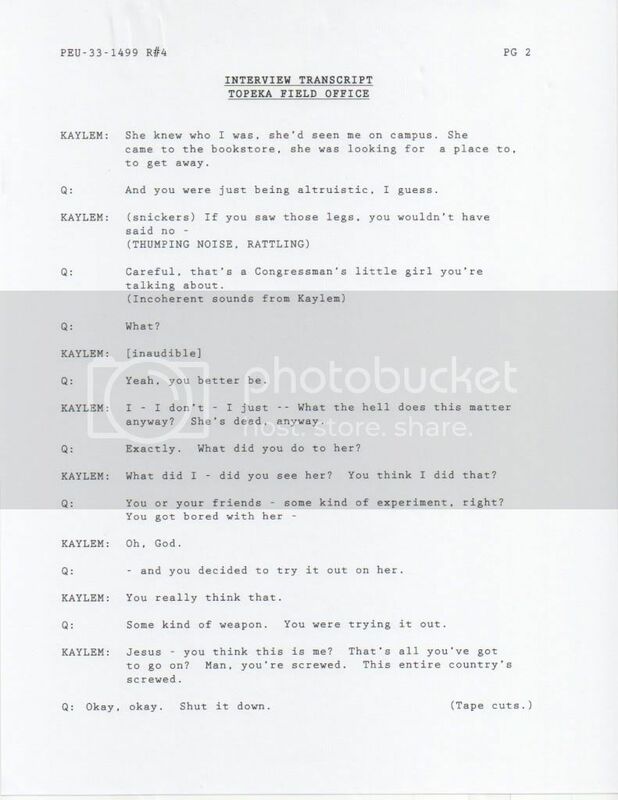 KAYLEM: Of course I know, why do you think she was with me? Q: 	-- to the Communist party. KAYLEM: She came to me. Q: 	You made her drop out, you lured. her. Q: 	And you were just being altruistic, I guess. Q:	Yeah, you'd better be. Q: 	Exactly. What did you do to her? KAYLEM: What did I - did you see her? You think I did that? Q: 	You or your friends - some kind of experiment, right? Q: 	- and you decided to try it out on her. KAYLEM: You really think that. Q: 	Some kind of weapon. You were trying it out. DESCRIPTION : Born 04-02-28 Detroit, Mich.
straw blond / brown hair (receding). FAMILY      : Married GrXXXXX 6. Divorce 1949. (Suspected sham marriage for citizenship). Father S.Sgt XXXXX Kaylem (deceased). BACKGROUND  : Member of various socialist / communist organiz. accident at job damaging right hand. Declared 4-F.
of marijuana. Disorderly conduct, public nuisance. to Party office in Detroit, MI. 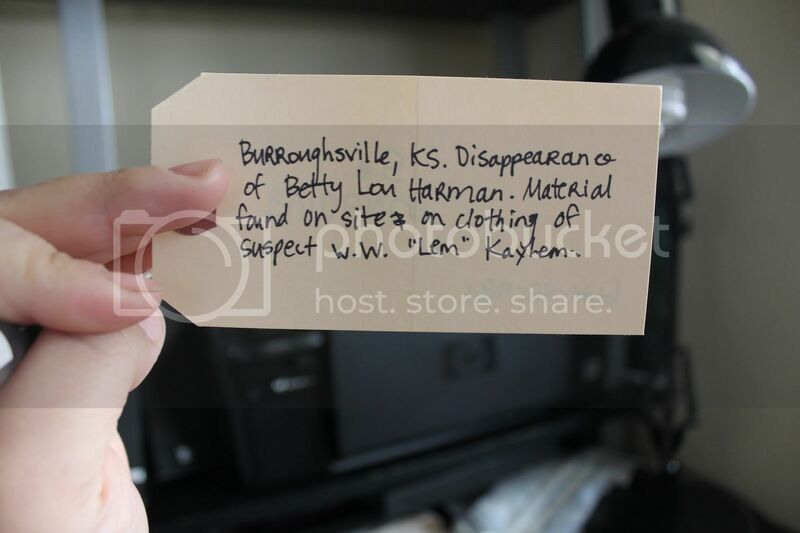 BURROUGHSVILLE, KS - The body of college sophomore Betty Lou Harman, 19, has been found. She was the daughter of State Representative Fredric Baines Harman, best known for his outspoken stance against Soviet influences here and abroad. Miss Harman was the object of a missing persons probe quietly conducted by the F.B.I. following her abrupt departure mid-semester from Millhaus College. Local rumors hint that a local Communist party organizer has been apprehended for questioning. Official sources have refused to comment. Note: This is on the reverse side of the 'Lightning Strikes Out Mavens Game' article. isolated fog / lightning storm incidents. a perfect day to picnic! [...]hit at the bottom of the [...]was a triple. With a final [...]core, triumphant Bluebirds [...]ed the win and secured a [...]the state finals. The edi- [...]staff of the Blueburgh Ga- [...]congratulates our bold [...]League Stars and wishes [...]the best of luck, as they [...]Akron next Saturday! "It was unlike anything I'd ever seen," said camper Art Bassman, a Montana resident camping near the base of Mount Serendip. He was talking about an isolated incident of black fog and lightning recently reported by several campers. The next morning, broken branches, scattered debris and dam- aged cabins resembled the aftermath of a small tornado, said witnesses. The event occurred on an otherwise clear night with no other reported storms. How- ever, several nearby towns reported electrical power fluctuations leading REA (Rural Electrification Administration) linesmen to check for storm damage to the grid. No damage was discovered. U.S. Forest Service Rangers are investigating the incident. "We want to ensure that we know what caused this," said a department spokesman. "All signs point to a freak natural storm. But regardless, we want visitors to know that we're prepared for it in the future." Note: This is on the reverse side of the Nikola Telsa article. Persons Involved: Nikodim Vesilyev, Ph.D.
A = NIKODIM VESILYEV, PH. 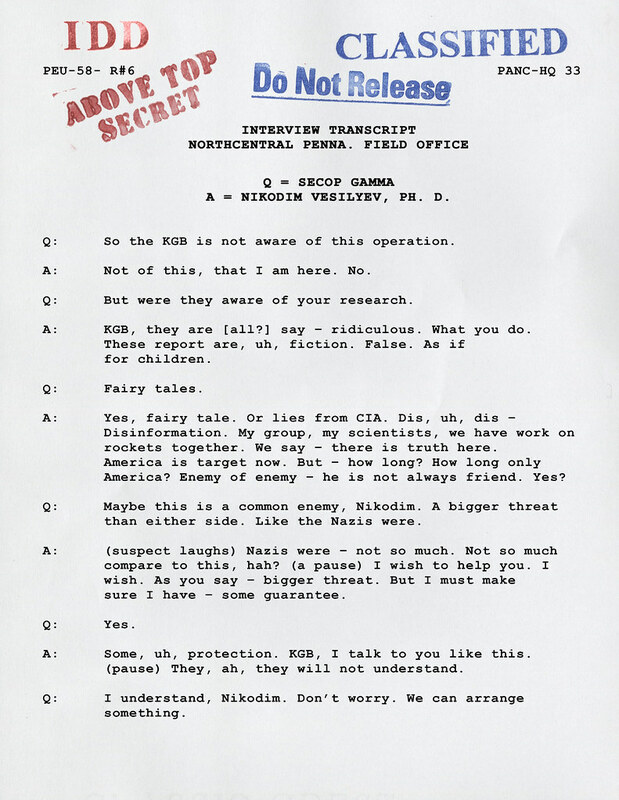 D.
Q:	So the KGB is not aware of this operation. A:	Not of this, that I am here. No. Q:	But were they aware of your research. A:	KGB, they are [all?] say - ridiculous. What you do. rockets together. We say - there is truth here. America? Enemy of enemy - he is not always our friend. Yes? than either side. Like the Nazis were. sure I have - some guarantee. A:	Some, uh, protection. KGB, I talk to you like this. (pause) They, ah, they will not understand. grow worse, I think. They learn. You know this? happen, they have, uh -- intelligence. Q:	Okay. We were afraid of that. XXXX This is why I am alone here in America now. A:	Yes. And now they - you know about XXXXX? Q:	XXXXX? What is that? Q:	(a long pause) You mean XXXXX? Q:	As if they XXXXXed? A:	No. I think you will find it - much more than that. As if they were XXXXX. XXXXX. Q:	And you have proof of this. uh, if you make arrangement. in here. Get Washington on the line. WEST BERLIN - Maurice V. Méliès, a high-ranking French embassy official, remains missing after local residents reported a fire at his modest home in West Berlin. At 7:00 yesterday, the fire department responded to calls in the bor- ough of Wedding. Black smoke had been seen near the Méliès home. Fire officials report structural damage and signs of a hurried escape, including overturned furniture. However, Méliès himself has not been seen. The U.S. Army is assisting French officials in an ongoing investigation. The investigators have declined to comment on speculation that the fire may have been the result of a kidnapping attempt or burglary. An official statement has not been released. Woman: (breathing heavily) Oh God. Man: Hello, West London Police. You have an emergency? Woman: Fog, there's black fog. Man: Do you have a fire? Woman: It's going to kill us! Man: What is your location ma'am? Woman: I'm at the call box. Woman: On Stoker. (screaming) Oh God, I've left him in the house! Woman: (screaming) My baby! He's in the house! Man: Hello ma'am? Ma'am, are you on the line? (Coalburg, PA) The body of area resident John Mariyai, 31, was found after he was reported missing some 48 hours earlier. Mariyai vanished from a construction site where he had been left on his own to complete a flooring project. When fellow workers returned for him later in the day, they raised the alarm. The dependable Mariyai had left the job half-finished - and he'd left his personal effects behind. In the hours that followed, Mariyai's family waited anxiously for updates as friends checked with local hospitals, police stations and morgues. Police were contacted Tuesday night and organized a manhunt sweeping the neighborhood. The body was found in a rarely used alley 300 years from the construction site, covered by a substance intitally believed to be roofing tar. Mariyai's fellow workers do not recognize the strange substance. Police now suspect it may be an organic mold or mud. As a crowd gathered, police removed the body. It is unclear whether Mariyai's death was accidental as was first assumed, and the investigation continues. Note: This is on the reverse side of the 'Representative's Daughter Found Dead' article. Of mysterious accidents, truckie says "blame the weather" PERTH - Last night, police questioned a professional driver in regards to the spate of accidents on the road to Perth. In recent months, there's been a pro- nounced uptick in the number of aban- doned vehicles dotting the long, lonely stretch of road skirting the Australian coast. Some have speculated that there may be bandits about. Not Garvey Grogan, a truckie hailing from Sydney. Grogan was overhead at many stops along the way, claiming he had some notions about the mysterious forces that haunt the road to Perth. He claimed his runs has coincided with a number of the strange incidents. Intrigued, police decided to meet the driver as he unloaded groceries during one of his weekly runs. Afterwards, Grogan bristled at hints that he may somehow have been in- volved with modern-day highwayman ambushing unsuspecting motorists. "There's no bandits about," Grogan told us. "Anybody who's been on this stretch of road has seen what I've seen. They've seen the black clouds." Grogan claims that globular black clouds and isolated lightning strikes have plagued the highway for months. "Anyone who's ever heard of Nick Tesla knows what's going on," said Grogran, referring to electrical genius Nikola Telsa whose fame rivaled Thomas Edison's. "Someone is experi- menting on the weather. It's stopping cars and killing people, and the govern- ment had vetter tell us who's behind it." Perth police say that Grogan has been cleared as a suspect. However, there is no word yet if they intend to follow up on his theories regarding the matter. Note: This is on the reverse side of the 'Britian To Continue Atomic Tests' article. FLORENCE - Local police are used to in- vestigating odd occurrences at a local lover's lane. With a scenic view overlooking the River Arno, the spot has drawn generations of amorous couples. They have left behind nu- merous mementoes for local patrolmen to remove. But this weekend, someone left behind an entire automobile - and police are baffled as to how it got there in the first place. "The car is not in drivable condition," re- ports a desk sergeant. "It appears to have been in a fire or explosion." The only clue regarding what happened are reports from local residents regarding black smoke and electrical activity spotted near the site. Damage to a nearby power transformer sug- gests the possibility of vandalism or attempt- ed sabotage. Local residents ominously hint that the vehicles owners were anarchists in- volved in the attack. Perhaps their getaway vehicle was thrown back into the lane by a badly timed explosion. Others wonder if two unlucky lovers were electrocuted by a fallen power line. Some speculate that the couples' deaths have been covered up to avoid official embarrassment. The police have a more mundane theory, believing that the damaged vehicle was towed and dumped here by a frustrated owner eager to be rid of it. The curious neighbors may never know the answer. The vehicle's identifying plates and marks have been destroyed or removed, and police have bene unable to locate the owners. Note: This is on the reverse side of the 'U.N. Debates "Germ Warfare"' article. The Littlevale Police Department is looking for the person or per- sons responsible for a random act of vandalism at Littlevale Memorial Park. Last night, a mysterious black goo was splattered around the tennis court in a circular pattern. The cause or purpose of the marking remains unclear. While most believe it is the work of a gang of local juvenile delinquents, others point to a group of Communist-affiliated rabble-rousers named in another recent vandalism case. Others claim that the circular markings resemble ritual markings for a witchcraft or voodoo ceremony. The park groundskeeper reports that the tarry stuff has been resistant to clean-up. "Whoever did this should be responsible for the mess," says the groundskeeper. Note: This is on the reverse side of the 'Letter to the Editor' article. Weekly notes from our friends in the country Maggie at the Elfed Tavern wonders: what's become of Old Bob Crwth? The wandering jack-of-all trades has been a familiar sight in the country for a number of years, offering his services for food, board and (mainly) drink. With harvest season around the corner, Bob could normally be relied upon to hold court at Maggie's corner table. If anyone's spotted him a-wandering, please drop a line. We wish Bob well and hope to hear of his doings soon. ********************** Rev. Allan Glyndŵr walks far and wide in our fair Welsh countryside. He reports recurring patches of an unusually dense fog. He wonders if this aught to do with the recent restlessness of the livestock that so concerns his parishioners. For our own part, we are curious if the odd clouds are connected to the strange black ooze that farmer Giles Owain discovered in his fields last week. All in all, it's been an odd season unsettling the normally unflappable folk of the valley. Note: This is on the reverse side of the The Novel of the White Powder article. -ject Cirrus." As part of the experiment, Navy planes flew directly into the brewing hurricane off the Georgia cost [sic] and re- leased a payload of "dry ice" (carbon di- oxide cooled to a solid subzero tem- peratures). The "seeded" clouds seemed to be dramatically altered, bolstering scien- tists' theories that the process could weaken the storm at a critical point. However, shortly afterward, the storm suddenly changed course, careening into the outskirts of Savannah. When residents learned about the ex- periment, many were enraged, especially those who had suffered massive prop- erty damages. Calling the experiment "reckless," they attempted to take the government to court. A new bid to challenge the experi- ment has failed in the discovery process because most of the documents related to the experiment have been classified. The government contends that the project is a matter of national security. Attorneys for the plaintiffs counter that the classification is a blatant abuse of se- crecy policies in an attempt to protect the agencies from legal scrutiny. Attorney Jack Scalley, representing a group of Savannah homeowners, com- plains about the timing. 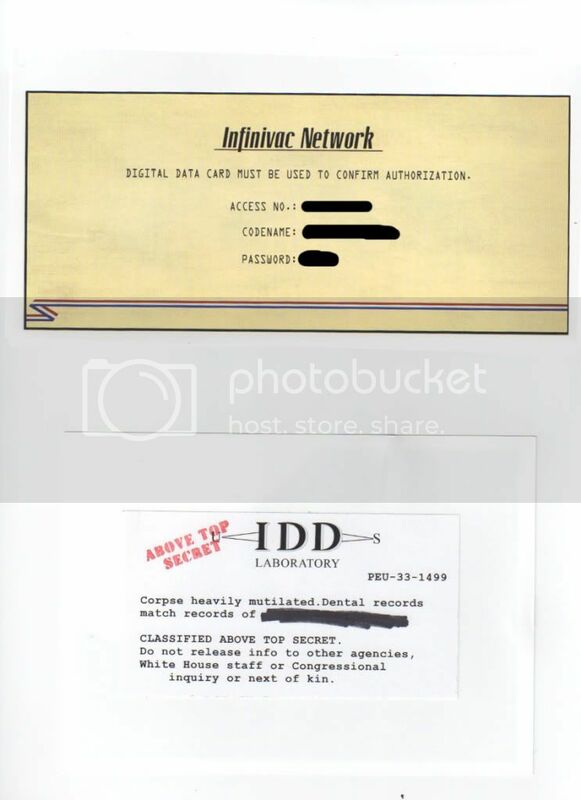 "A number of these documents weren't classified until after the experiment," says Scalley. "That's the locking of the barn door after the [...] run off. Obviously somebody realized they'd made a mistake[...] wanted to hide it. They're not[...] worried about the Russians, th[...] worried about American cit[...] getting their due." However, government sp[...] men refute the claim. One Pentagon official says[...] tragic that the hardworking [...] behind the project have [...] wrongly blamed. What's wors[...] United States' efforts to inves[...] this area have been utterly de[...] Other governments are bou[...] continue looking into weather[...] trol, which would give them huge advantages in agriculture[...] we dare not overlook the m[...] potential of this technology." At this point, the lawsuit has [...] effectively quashed unless la[...] for the homeowners are succ[...] in a bid to have the documen[...] classified. Note: This is on the reverse side of the 'New Jersey Housewife Remains Missing' article. CONGRESSIONAL CANDIDATE ASKS: "WHO LOST CHINA?" Note: This is on the reverse side of the 'Foul Play in Diner Death' article. Note: This is on the reverse side of the 'Vandalism at Local Park' article. Note: This is on the reverse side of the 'Mystery At Lover's Lane' article. about areas of military research in the U.S.S.R.
matter as additional concrete intelligence emerges. CANBERRA - At a press conference yester- day, a British minister confirmed that Britain will test atomic weapons in Australia. The tests will occur in isolated areas, in- cluding the Montebello Islands. The minister cited the need for multiple tests for the pur- poses of scientific measurement. Tests will assess the effects of the weapons on radar, motor vehicles and other implements of modern warfare. Australian ministers responded to con- cerns about safety. "All areas used in testing will be unpopulated and the general public will not be affected in any way," they said in an official statement. 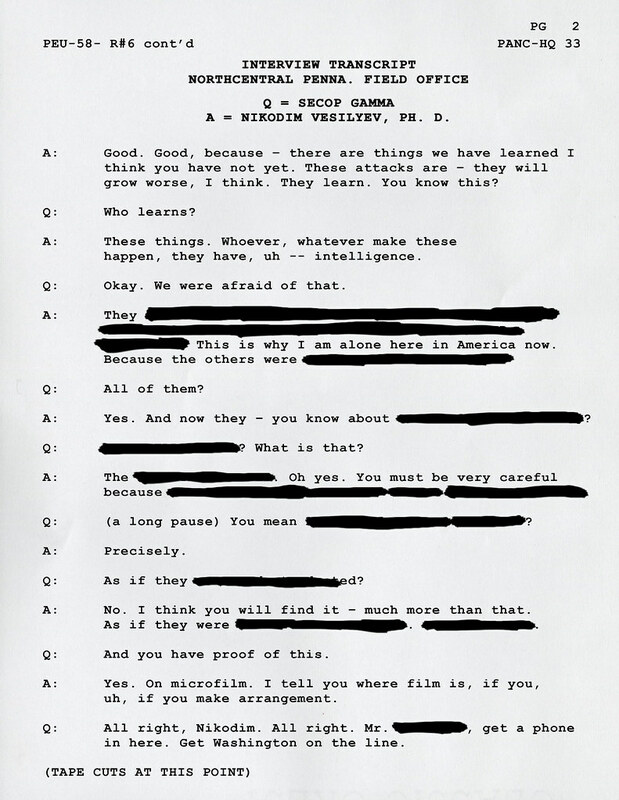 Though the program of testing was ini- tially met with government denials, the exist- ing of Operation Hurricane was confirmed by British and Australian government officials. The necessity of atomic weapons for defense was cited as a vital issue in the changing state of the world. "As long as we are at risk of being tar- geted by such weapons, we must arm our- selves to deter other nations from consider- ing a first strike." Note: This is on the reverse side of the 'Fog Over Perth' article. Note: This is on the reverse side of the 'Strange Weather In The Rockies' article. [...]Welshman crafted a work bound to elicit genuine goose-flesh. The book provides a framework for several self-contained tales of dread. Perhaps the most famous, often anthologized by itself, is "The Novel of the White Powder". In the story, a young man takes ill and is prescribed a white powder by his chemist. The man's loving sister becomes concerned as her brother becomes increasingly reclusive. Apparently addicted to the substance, he slowly undergoes a grotesque transformation. It would spoil the tale's effect to mention any more. Yet perhaps more interesting than the loathsome horror is the inventive mechanics by which it is arrived. Ultimately, we discover, the young man's addle pated chemist followed archaic recipes and used ingredients fouled by age. Thus, he accidentally recreated a universal solvent described by the ancient alchemists. Is such a substance an actual possibility? The possibility chills the bones. Yet it is well-known that our Welsh author translated many odd manuscripts of ancient vintage, and for a time, belonged to an occult organization devoted to the studies of the ancient science of meta-physics. If our modern scientists obtained such a formula, one is unnerved by how it might be unleashed. Such thoughts, it appears, occurred time and again to our author. He composed numerous tales juxtaposing results of the occult science with matters of warfare. His novel "The Terror" is a prime example of this mode of storytelling. Note: This is on the reverse side of the 'The Word From Round & About' article. See the Intro page for a list of all the websites, plus brief information about this guide and the game.